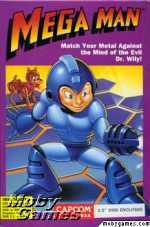 In the PC version of Mega Man, it's up to the blue robot Megaman to stop the plot of Dr. Wily, the maverick lab assistant, by jumping and shooting his way past an army of robots. At the end of these levels are three of Dr. Wily's robot masters, Dyna Man, Sonic Man and Volt man who each drop a key when defeated. These keys are then used to gain access to the room where the megacomputer Crorq is being stored for a final showdown. As always, Megaman can absorb the weapon power of the robot masters and use it as his own. Mega Man is a side-scrolling platform game. It differs greatly from the original megaman game with only three bosses and not very many extras to find. Lesser robots can defeated and drop a variety of power-ups including an energy capsule for filling energy, a weapon capsule which restores the power of captured robot weapons, an extra life, a continue and an energy tank which will restore all of Megaman's energy once. Instead of creating faithful reproductions, Hi-Tech reduced the excellent anime characters that NES fans have come to know and love to laughable animated blobs - with Mega Man himself looking like a broken-doll version of Commander Keen ... a cabbage patch doll gone awry, so to speak. The graphics are dull, and even the innovative gameplay that lets Mega Man transform himself into different robot types can't save it from mediocrity.